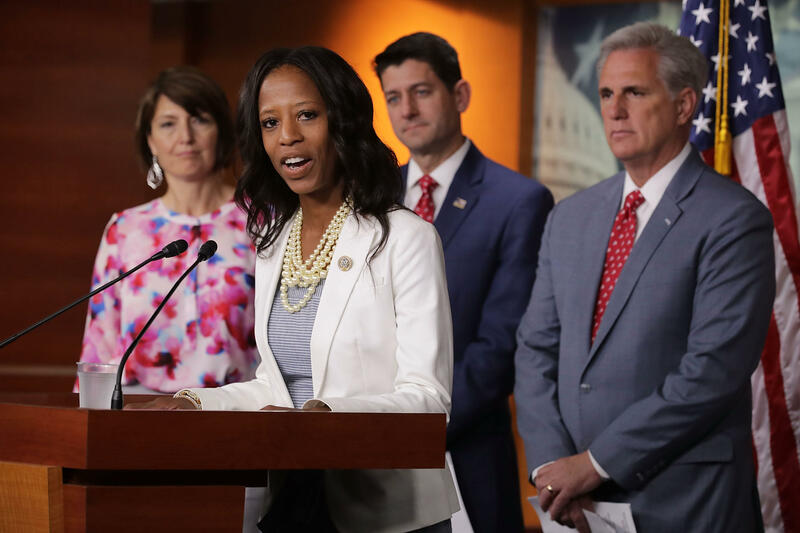 SALT LAKE CITY -- Utah's Mia Love was tabbed as a rising star in the GOP when she became the first black Republican woman in Congress with her 2014 victory. But on Tuesday, the Associated Press reported that she became the latest Republican incumbent to fall in the midterm election's Democratic wave that has seen more than three dozen Republican-held seats flipped across the country. CBS News has not yet estimated a winner in this race. Ben McAdams, a Democratic mayor of Salt Lake County, defeated Love by fewer than 700 votes in a back and forth race that took two weeks to sort out in deep-red Utah. Love had a built-in advantage with Republican voters outnumbering Democrats three-to-one in the mostly suburban Salt Lake City district, but she never seemed to catch on with voters the way other Republican incumbents have in the state, said Damon Cann, a political science professor at Utah State University. She tried to distance herself from President Donald Trump on trade and immigration and she highlighted the times she stood up to the president, like when Mr. Trump used an expletive to describe her parents' home country of Haiti. Mr. Trump won Utah in 2016 but the state's voters have long been uncomfortable with his brash style and his comments about women and immigrants. "She seemed to struggle a little bit more how to strike that balance without losing too many votes," Cann said. Trump calls midterm elections "an incredible day"
Mr. Trump didn't appreciate her approach, calling her out by name in a news conference the morning after Election Day, where he also bashed other Republicans who he said lost because they didn't fully embrace him. Love, the first and only black female Republican in Congress, was seeking a third term. She said in a statement she planned to call McAdams, but didn't say if she would concede or congratulate him. She said she's traveling with family for Thanksgiving and won't speak about the race until Monday. McAdams touted himself as a moderate, and not a typical Democrat, in a pitch that seemed to resonate in the district where nearly four in 10 voters are independents. He also benefited from record voter turnout that was driven in part by a medical marijuana ballot proposal that spurred progressive voters to the polls, Cann said. McAdams was an excellent candidate and also probably benefited from displeasure with Mr. Trump and the Republican party, Cann said. "The winds were all at McAdams' back," Cann said. McAdams will become the first Democratic member of Utah's congressional district since 2014 when longtime Rep. Jim Matheson retired. "This race was about connecting with Utah," McAdams said. "This race was about who was best positioned to serve Utah and working to not get it caught up in a national, partisan election." Love finished about 20 votes short of being able to request a recount in a race where about 269,000 votes were cast. This is the second time she has lost a bid for Congress by a razor thin margin. In her first run in 2012, Love lost to incumbent Democrat Jim Matheson by 768 votes. She went on to defeat Democrat Doug Owens in 2014 and again in 2016. For McAdams, it's a victory that validates his reputation as an emerging political force in Utah. He became known for working with the state's Republican leaders on issues such as homelessness, where he backed a narrow Medicaid expansion to cover treatment and once went undercover as a homeless person when the issue reached crisis mode downtown. McAdams said during the campaign he would not support California Rep. Nancy Pelosi as House Speaker and insisting he'd be able to work with the president. He has already signed a letter along with 15 other Democrats vowing to oppose Pelosi. He sharply criticized Love's support for the GOP-backed tax overhaul and said she had not been available enough to her constituents at town halls. Love pushed back hard, saying the tax overhaul has been good for people in Utah and defending her approach of meeting with voters in smaller groups, on the phone or online. Voter turnout among registered voters was the highest for any midterm election in Utah since 1962 at about 74 percent, according to Justin Lee, the state elections director.